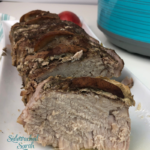 Slow Cooker Pork Tenderloin with Apples is an Easy and Delicious Meal. The Sweet and Savory Flavors Are Sure to Please Your Whole Family! 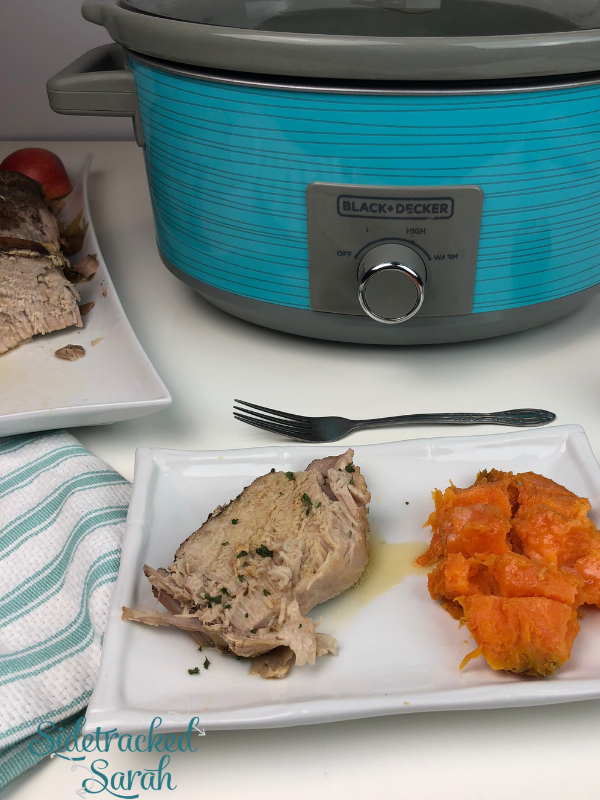 We love Slow Cooker Pork recipes! Some of our favorites include Crockpot Chalupas and Crock Pot Sausage and Peppers (on a bun). Pork Tenderloin is such a wonderful match for tender, juicy apples. The sweet and savory flavors just go so well together! However, pork tenderloin can dry out in the oven if you don’t babysit it. That’s why I love cooking it in the slow cooker – it always comes out perfectly! I have my favorites, but you can use a variety of apples. I would recommend using apples that are fairly crunchy, rather than the baking varieties. Otherwise, you’ll end up with applesauce rather than tender-crisp apple slices! Past that, it really depends on whether your family likes something a bit sweeter or a bit more tart. Red Delicious, Honeycrisp, and Granny Smith are all good choices. 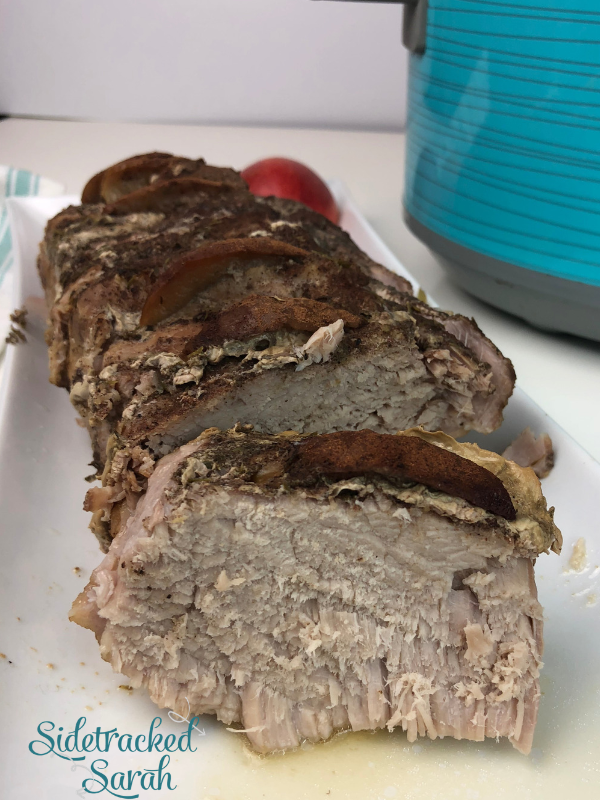 WHAT SHOULD I SERVE WITH SLOW COOKER PORK TENDERLOIN WITH APPLES? 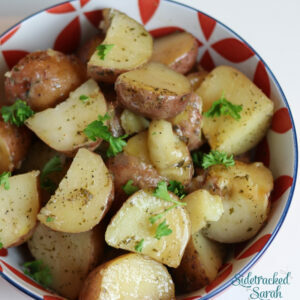 This dish is so delicious that you really don’t need to dress it up with much! Just whip up a quick salad and some Instant Pot Scalloped Potatoes, and you’re good to go! 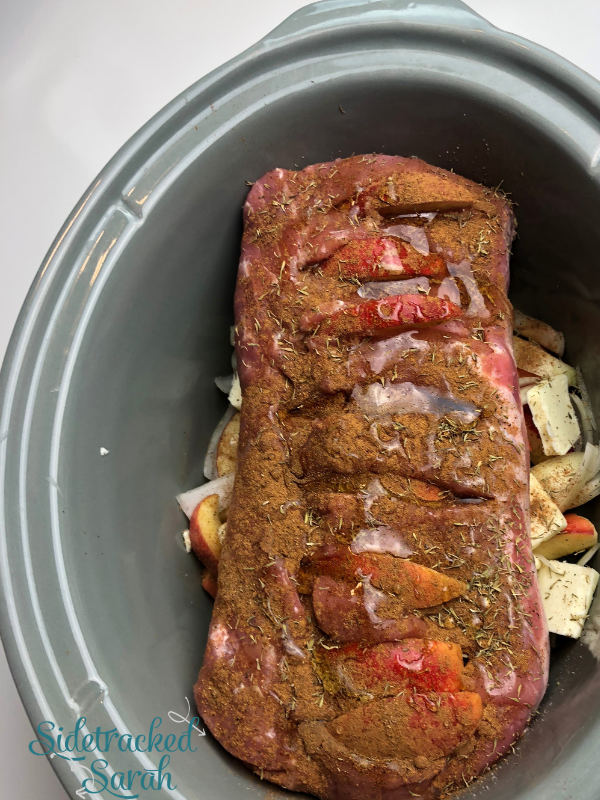 WILL SLOW COOKER PORK TENDERLOIN WITH APPLES FREEZE WELL? The pork tenderloin will freeze well, and there are so many delicious ways to use it. You can freeze the apples, but they may get a bit softer with freezing, thawing and reheating. This meal is a favorite of ours, and I know your family will love it as well! WANT MORE EASY SLOW COOKER PORK RECIPES? Slice 3 apples & 1 onion. Cut slits into the tenderloin. Place apple slices into the slits. Mix together apple and onions and pour into the bottom of the slow cooker. Slice butter and place over the top of the apples and onions. Add pork loin over the top of the onions and apples. Sprinkle with salt, pepper, cinnamon and then thyme. Pour honey evenly over the top of the pork tenderloin. Homemaking Bundle + Free $31 Gift for Sidetracked Sarah Readers!